So being as this is a dumpling cart, it’s time to post a few dumplings. I’ve made this recipe before by adding the balls to a lentil soup, but decided to try it again with my family. It’s adapted from Chu and Lovatt’s The Dumpling: A Seasonal Guide, with a few notes and pics of my own. 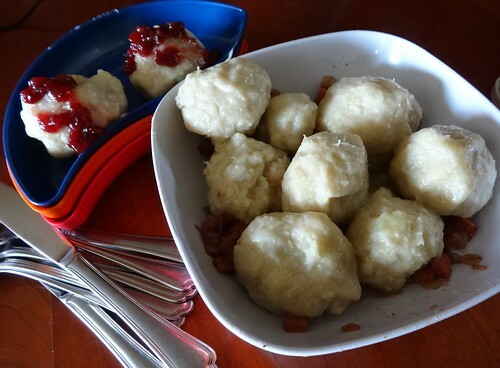 So, Kroppkakor translates literally to “body cake.” These Swedish potato dumplings are often stuffed with ham or pork, and served with a lingonberry sauce. I find this especially fun because my mother’s grandmother was Swedish; the family came to America from Skåne län in the 1870s. This recipe makes 8 chunky dumplings smothered in butter and lingonberry jam, and serves 4-5 as a small but filling meal. Took us about 2 hours to prep, but you could probably prep sides at the same time. Equipment: medium skillet, medium pot, kitchen knives, kitchen towels/cheesecloth, cheese grater or potato ricer, tray or serving dish. 1. Make Filling: Melt 2 T butter in skillet over medium heat. Add onion and stir until soft (4 mins). 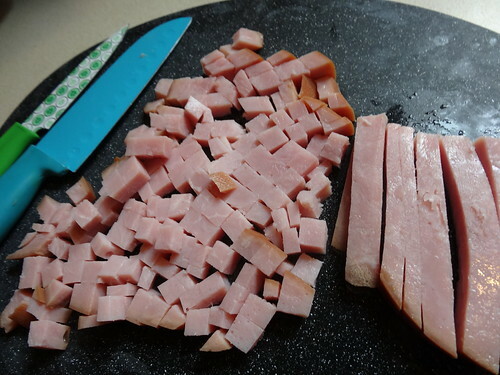 Add ham and allspice, stirring until ham and onion start to brown (2-4 mins). Scoop mix into a bowl and let cool. (Obvs. turn off the stove then, if you’re not using it). 2. 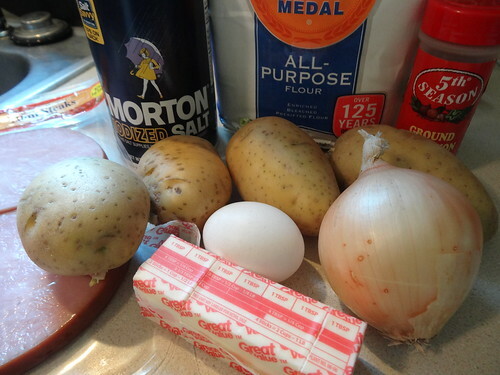 Make Dough: Cut up two potatoes, heat to boil, and simmer until fully tender (30 minutes). (I was boiling them whole until sis pointed out that chopping reduces cooking times…) Place on folded kitchen towel, then peel the skins and mash the flesh in bowl until mostly smooth. 3. Peel the two raw potatoes and grate through fine holes of a box grater onto kitchen towel (or cheesecloth). 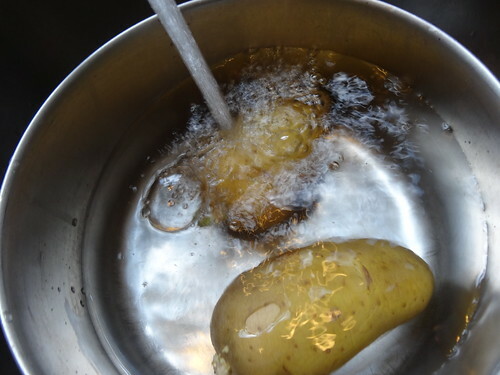 Squeeze out as much potato juice as you can, in smaller batches if needed. 4. 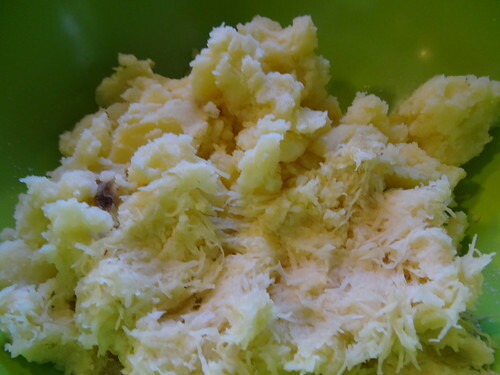 Mix grated and mashed potatoes with the salt and 1/4 cup of the flour; mix it all with your fingers. Then, work the egg into the mix until you have a moist dough (2 minutes). The dough should be firm enough to hold a log or ball shape; if too soft, add the remaining flour. (I’ve always ended up with very slithery dough at this point, so have added much more flour than the recipe calls for). 5. Assemble Dumplings: Sprinkle tray with flour; have potato dough and ham mixture ready. 7. Meanwhile, place the dough on a floured surface (we use mom’s method flour sprinkled on a plastic grocery bag; easy cleanup). Roll a foot-long log of dough, divide in eight pieces. 8. 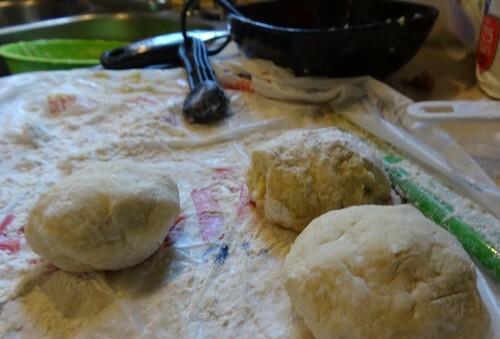 Now, roll each piece into a ball and dust with flour. Use your thumbs to shape into a soft, wide bowl 2 inches deep, cupped in your hand. 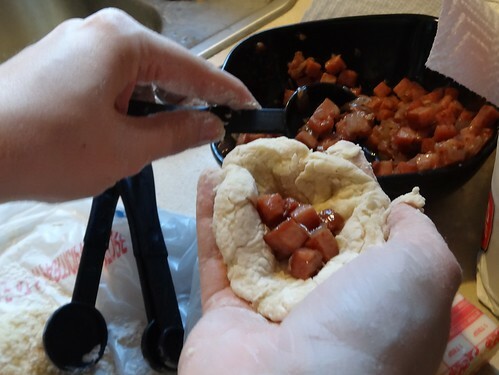 Put a round tablespoon of ham mix into the center, and pinch the dough up and around the filling (push out any air). Dab water to seal edges of dough, if needed. Dust with flour and place on a tray. 9. Cook Dumplings: Once the raw dumplings are ready, bring water back to a boil, then reduce the heat to medium for a steady simmer. 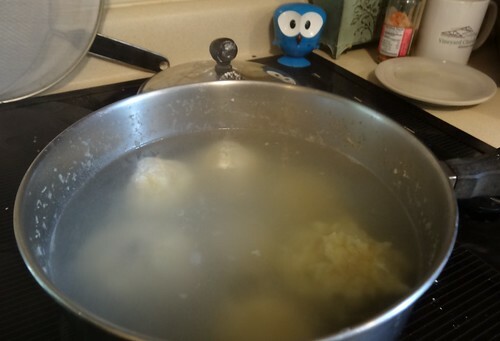 Drop dumplings one by one into water, cover, and simmer 10 minutes. Stir to prevent sticking. 11. Remove the kroppkakor with a slotted spoon and set in shallow serving bowl. Drizzle with 1/4 cup melted butter (you may not need this much) and serve with lingonberry jam or other sweet-sharp preserves. Läcker! (Mmm, delicious!). For a few other variations, check out Anne’s Food and Kokblog. Other blogs do suggest that kroppkakor are also delicious when sliced and fried the next day, but we didn’t get that far — we ate them all up! My father was born in Sweden and we used to have what we called cumsen and mesa at special occasions. 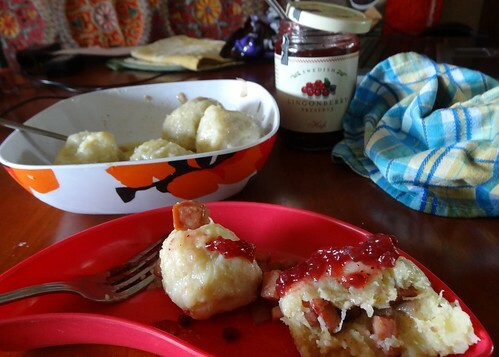 They were potatoe dumplings as described here but instead of ligonberry jam we had a rich gravy made from mysost cheese (whey boiled down then thinned with cream or butter). Does anyone else know what this is, or the correct spelling?